The Lifemusic approach provides a space for anyone to create music in a safe and relaxed atmosphere. It offers a unique method for creating music out of ideas, images, stories and feelings. The Workshops are for all, regardless of age or previous experience. There are no wrong notes in music ! Every sound has a meaning. It provides experiences, which encourage a feeling of well-being. So what is ‘Lifemusic’ ? MUSIC has always meant a lot to me but when I discovered ‘Lifemusic’, found it was more important to me than I’d thought. It’s all around and part of us; we each have our own rhythms; our lives have their own rhythms. (our ‘Symphonies’.) The great benefits of the ‘Lifemusic’ approach can be experienced in the sense of well-being and satisfaction after each session. “Life is not measured by the number of breaths we take but by the moments that take our breath away”. Take a ‘paintbrush’ of musical instruments, the things around us, our own voices and with unique strokes, paint ‘a picture in sound’. Everyone’s contribution is important and accepted; every sound has a meaning and a purpose. ‘Lifemusic’ opens up a whole range of new dimensions and possibilities. So what is a ‘Lifemusic session’? No two ‘Lifemusic’ sessions are they same. They are unique because each group of people and the time together is unique, so the music which is produced during that time can never be repeated again. Here are two examples of a ‘Lifemusic’ session. A group of twenty 6 – 8 year olds and a large collection of musical instruments including djembes, tambours, cymbals, Boomwhackers and a singing bowl. Suddenly the sound of a singing bowl growing louder. Then a lady with a big drum beginning a quiet steady rhythm. Then Boomwhackers, small drums, crash of cymbals, shakers, electronic drums. Someone giving a ‘whoop’ and others joining in until there is a sense of celebration! The whole group is ‘alive’ and it’s wonderful to see the connections between individuals – the smiles, laughter, swinging with the rhythm and the beat. ‘Catching each others’ eyes’! Then the theme, “National Anthem”. A military march, others joining in, one person singing “I’m ‘Enery the Eighth I am”, another joining in with , “Land of Hope and Glory” , someone else the notes from ‘Eastenders’. A group of children each with an animal puppet – including monkey, lion, rabbit, parrot. They’re busy choosing a musical instrument and trying it out. Then we’re making the sounds of the jungle, beginning with shakers and drums. Then a rain stick and a cymbal. The boy with the monkey is making monkey sounds; the girl with the lion a roar; an adult in the group the sound of a parrot. Other musical instruments joining in. I said, “It’s starting to rain!” The instruments getting louder and the rain stick ‘raining’. Someone made the sound of thunder. The animals getting louder. There we were in the jungle. There in the jungle! I said, “The rain’s stopping, the sun’s coming out!” The instruments got quieter; the animals got louder! 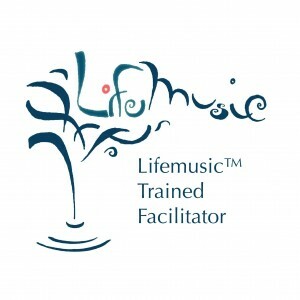 ‘Lifemusic’ is all inclusive, it promotes communication, self esteem and well-being. It’s FUN !